Chicken Oreganato is a delicious farm to table and freezer friendly. It’s a great way to use up summer produce including herbs, early potatoes, and tomatoes. With a quick prep and clean up, this recipe is sure to become a favorite at your house! Welcome to another installation of Tuesdays in the Garden! 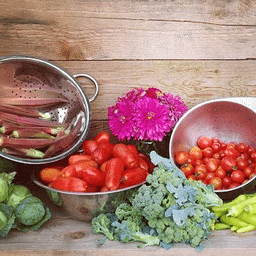 This week, we’re sharing summer gardening goodies: tours of beautiful summer gardens and delicious ways to use up the summer bounty! You can find links to all the beauty at the end of the post! I’ve been making this Chicken Oreganato dish for a long time and love that I grow most of the ingredients it contains in my garden (I even raise my own meat chickens!) so this is a real farm to table recipe. It’s quick to prep, but it does take a while to bake because of the skin, bone-in chicken pieces. If you know how to cut up a whole chicken, this recipe is also quite frugal even if you have to buy the chicken. I know a lot of people don’t like to mess with whole chickens, but if you’re looking to reduce your grocery budget, this is a good recipe to try. If you don’t like all the various chicken pieces, just use 4-5 pounds of whatever bone-in pieces you like most and skip the whole chicken altogether. I originally found a similar recipe in a great freezer cookbook – Don’t Panic–More Dinner’s in the Freezer: A Second Helping of Tasty Meals You Can Make Ahead. We’ve made it numerous times and have also frozen it as per the instructions in the book, which include freezing the potatoes. But here’s the thing. Raw potatoes just don’t freeze well. So if you make this for the freezer, I recommend leaving the potatoes out of the bag you plan to freeze. The, just add them on cooking day! Super simple. To make this easy, one dish meal, prep your veggies and put them in a 9 x 13 baking dish. Mix fresh oregano with olive oil, salt and pepper. Top with chicken and pour the olive oil and herbs on top. Bake at 375 degrees until the chicken is cooked, 40-60 minutes for bone in chicken pieces. To make for the freezer just mix everything in a large bowl. Stir until it's all coated. Place chicken and veggies in a freezer bag. Freeze. Place chicken and veggies in a large roasting pan - put the chicken on top of the veggies (skin side up, if your meat has skin). Mix herbs and olive oil and pour over chicken and veggies. Roast until chicken juices run clear, about 40-60 minutes for skinned chicken pieces, or less for boneless, skinless meat. You can freeze this meal. I'm not crazy about freezing potatoes because they turn an awful shade of black, but everything else freezes quite nicely. If you'd like to freeze this meal, I recommend mixing everything together (except the potatoes) in a gallon ziplock. To cook, thaw., add fresh potatoes, and follow the baking instructions above. If you don’t like bone-in chicken, you can also use skinless chicken breasts or thigh fillets. I’ve made it with fillets too and it’s also delicious. If you make it with the fillet pieces, cook the veggies for 20 minutes and then add the meat at the end so everything is cooked through and nothing is undercooked. I hope you’ll pop around to see what’s going on in the Tuesdays in the Garden blogger’s summer gardens! Unfortunately, I don’t have much of a garden this year so I have to live vicariously through them! Between working to transistion to raised beds and too much travel, my poor garden has really suffered this year. I’ll have to give fall gardening a real go because my summer garden has pretty much been not much at all. 🙁 Here’s what’s going on around the blogosphere though! 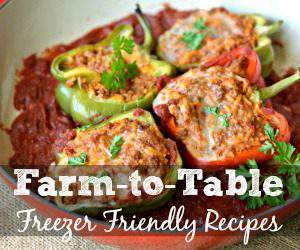 Looking for more freezer meals? Here are some of my favorites! I like this one!! We are suffering from Chicken Overload around here, this will be a nice way to use more of it!! Sounds good!! I think I will make it this week!! Do the potatoes and tomatoes freeze well though? I have this in the oven for tonight's dinner (straight in -- didn't freeze it first). It smells wonderful! I just found your blog through the Boost Your Blog challenge and I immediately went for the Freezer friendly recipes section. I haven't started freezer cooking yet but I'm slowly collecting recipes. This would be a great change in our menu. I think I'll freeze the meal without the potatoes and then add them once the dish is thawed. I think it's a good idea to freeze without the potatoes. Alternatively, you could boil them for 1-2 minutes before you freeze as well. This post is on my re-do list. It might even be an example for the Boost Your Blog Series! Thanks for commenting. Beautiful photos, Michelle! This looks stunning. Hi Michelle, This looks great and I love that it's a good freezer candidate especially now that most days is just my husband and I. I can get a 2 for 1 by freezing half. Makes life a little easier. Thanks! Oh, this chicken dinner looks delicious and easy to make. Thanks for sharing it I know my family will love it. I am slowly coming around to make ahead freezer meals. With just two of us to feed it makes more sense. Back in the day I had so many mouths to feed I could never get ahead of it :) Thanks for the great recipe. It looks delicious! I love freezer friendly meals but yes, I agree that it's not good to freeze potatoes.